You and everyone interested in Journeymen Raleigh (a chapter of Boys to Men International) are invited to come support the young men who completed their very first Journeymen Rites of Passage Adventure Weekend (ROPAW), that was held recently in Asheville and put on by the Journeymen Asheville). 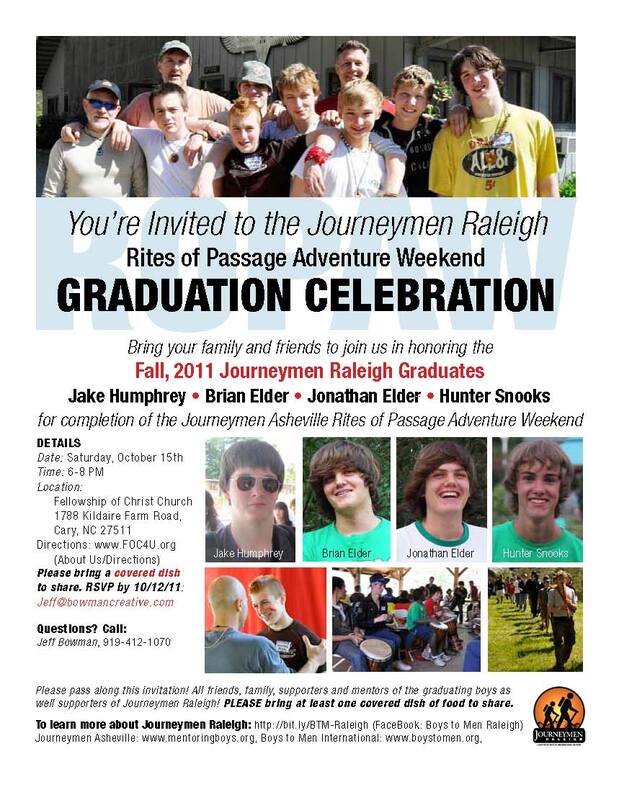 The Graduation Celebration will be held on Saturday, October, 15th, 6-8 pm at Fellowship of Christ Church in Cary, NC. Journeymen Raleigh will have 4 boys graduating (3 local, and one long distance from Louisiana). Please come, invite your family and friends, and anyone wnating to find out more about this mentoring program to come and support these fine young men on their journey to manhood, and honor them for completing this week-end. Food is covered dish. So come with a covered dish to cover you, your guests plus a few others. ← Teen boys can register till Oct. 6th for the Rites of Passage Adventure Week-end (ROPAW)!